• Water & Maintenance: Once established, plant will need little to moderate maintenance. It is however appreciated for its drought and heat resistance. 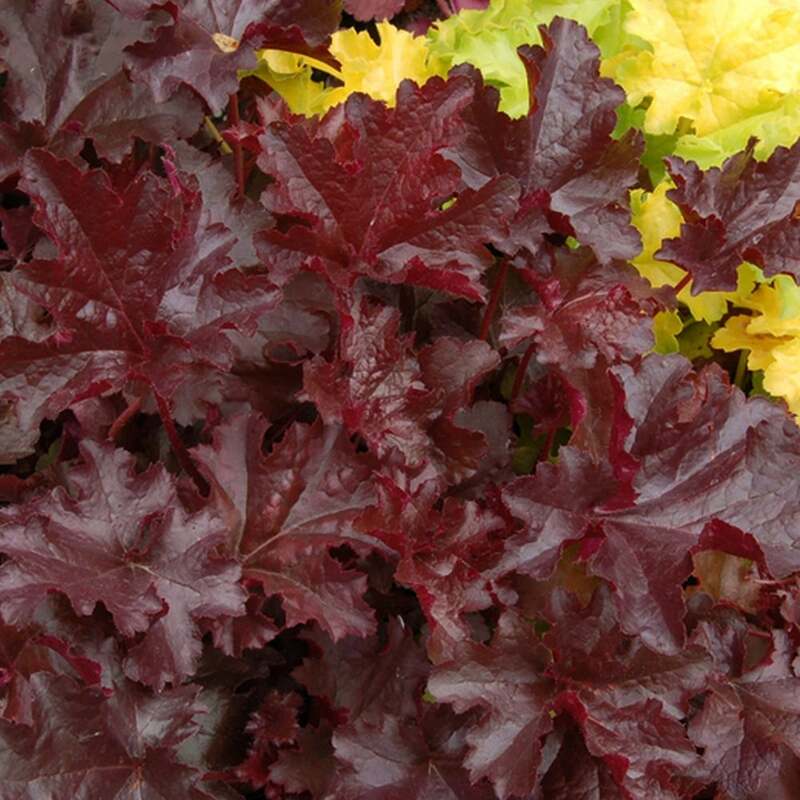 This variation of the Heuchera offers a variety of colours in the full sun to partial shade. Some of the lower leaf growth may exhibit a deep green to mahogany or garnet colours. And the portions of the plant that are better exposed to the sun develop a deep chocolatey-red colour. The delightful little buds are transported upwards through the base foliage on dark-coloured stalks and appear in plentiful bunches throughout the plant’s growing area. The flowers are white to off-white, and sometimes appear as if stained by the underlying chocolate colours. These flowers do well to attract butterflies and other pollinators. The plant can be used in planters or tubs and also provides intriguing accents to beds and borders. It also works very well as a complimentary piece to adjacent taller plants like bushes, shrubs and trees. In sheltered or protected areas, this plant can be an evergreen and appear year-round. As a perennial, it is important to mulch for the winter cold. A spring cleaning may be necessary, but allow the foliage to remain after the primary growing season and into the autumn and winter. It may need splitting every three or four years.